It is one thing to know how to go about shipping commercial freight domestically. If you have done it for years, chances are it is all second nature to you by now and you know exactly what you need to do. Whether you have purchased your truck outright, or own your vehicle through a commercial truck loan or commercial truck leasing agreement, there are some things that you need to know when transporting freight across borders. Examine your shipping documents prior to arriving at the border. It is a good idea to know exactly what your shipping documents say before arriving at the border, especially with regards to any special instructions by the shipper. Make sure you are aware whether or not you are to stop at customs before proceeding in either direction to avoid any unfortunate mishaps or misunderstandings. Submit your ACE e-manifest. All commercial truck drivers entering the United States must have their ACE e-manifest submitted online prior to entry. If you don’t declare something on your e-manifest by accident and it is discovered during a routine stop or inspection, this could spell big trouble for you. 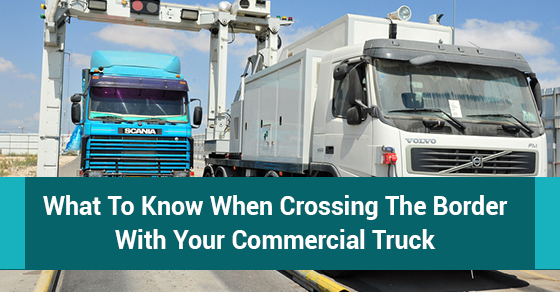 If you’ve gone and invested your money in a commercial truck loan, it would be terrible if you risked your ability to operate because of hasty paperwork. You will need to display proof of citizenship like anyone else. Just because you are driving commercial freight does not mean that you don’t have to provide proof of citizenship. Make sure that you have your passport ready to show, as well as your license to operate a commercial freight truck, if need be. Entering the United States. Any vehicles entering the United States are expected to enter using the right lane at the exit bridge or tunnel and enter the inspection plaza once they have successfully crossed the border. Once you have entered, your first point of inspection is known as “primary inspection.” If you have all of your paperwork in order and have submitted your manifest beforehand, this is often the only stop that you will have to make and can proceed onto your destination. You have invested time and money into a commercial truck loan and/or a commercial truck lease to allow you to operate your business across borders. Make sure you know your rights and responsibilities before you attempt to ship across border and make the process as seamless and stress-free as possible.